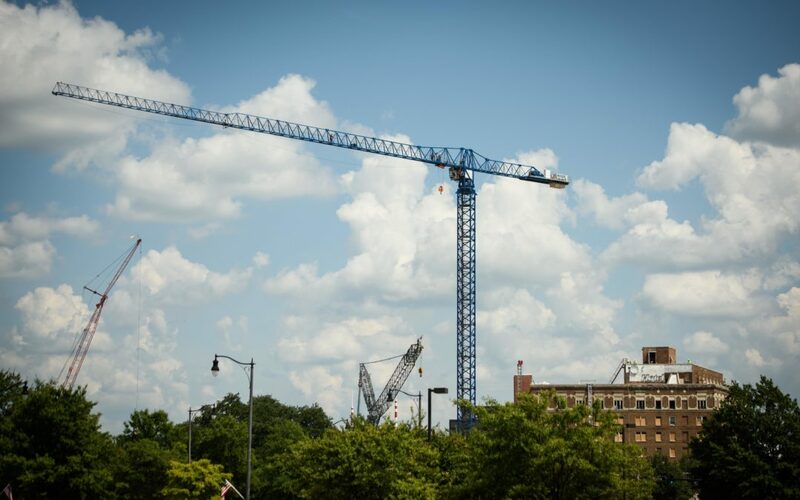 In Fayetteville, North Carolina, a 180-foot tall flat top tower crane has been erected for use with the Prince Charles Hotel construction projects, which include renovating the old hotel into apartments and retail space, as well as building a parking garage, new hotel and office building. Bryant Industrial Crane & Rigging assisted with the assembly. It is all part of about $65 million in private investment around the baseball stadium the city has under construction that will be home to a minor league team for the Houston Astros. The crane will hover over the downtown area for the next 20 months. It allows large parts to be moved in tight spaces, said Jordan Jones, the project manager for Prince Charles Holdings. “It will be used to build our five-story parking garage, a five-story hotel and six-story office building,″ Jones said. Jones said the pieces of the crane were driven to the site by semi-trucks from Charlotte and then were put together using another crane. Prince Charles Holdings LLC is the Durham-based group turning the 93-year-old hotel on Hay Street into a mixed-use project. The crane is being used to piece together the new buildings that are part of the overall development plans. A new six-story office building is expected to open in the summer of 2020, as well as a five-story hotel. The five-story, 486-space parking garage is scheduled to open in March. Prince Charles Holdings is leasing parking spaces from the city, which will own the garage. Jones said a trained crane operator comes with the rental of the equipment. The operator stays in an indoor area of the crane on a platform for as long as 10 hours a day. Fayetteville Mayor Mitch Colvin said the crane has a positive symbolism for downtown development. “I think we are at the point where this is the first form of vertical construction we’ve seen downtown since the 1970s, at least the early 1980s. I’m excited about it,” he said. Staff writer John Henderson can be reached at [email protected] or 910-486-3596.